(Thanks to Bill Powell for his clarifications and corrections). 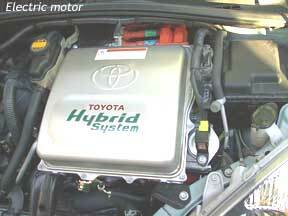 The hybrid-electric car is, we think, the wave of the future. As the limitations of electric cars became clear - limited range, heavy batteries, recharging, and the blatant inefficiency of using power-line related energy loss - the advantages of the hybrids started to show. No need to plug in; lighter batteries; and the efficiency of creating energy on the spot, combined with the electric-car advantages of regenerative braking and coasting, and the emissions-reducing potential to have engines that stay at a single speed for relatively long periods of time. The Toyota Prius is the car of the future, available from Toyota dealers today - or, if you live in Japan, since late 1997. With an interior roughly the size of a Toyota Camry or Honda Civic, the Prius achieves an amazing 55 mpg in the city - about 42 on the highway. No, we didn't reverse those numbers - the Prius is built for stop-and-go city and suburban traffic, and the slower you go, the higher your mileage. City mileage is also greatly helped by the fact that, unlike "normal" cars, the Toyota Prius regains some of your energy when you stop, taking what would normally just be heat (and worn brake pads) and converting it back into electricity. City roads also tend to have fewer hills. Actually, gas mileage varies dramatically based on your driving. If you are easy on the gas and drive with slow, steady acceleration, you will do much better. If you tend to do a lot of stoplight racing and drive at over 75 mph on the freeway, you will do much worse. Likewise, since the engine seems to get about 10 mpg less when cold (since the gas engine is always running until it warms up), if you live in the North and do a lot of small trips, gas mileage will be relatively poor. Summer mileage is, we expect, substantially higher than winter mileage, because the engine needs to run less to operate the heater and keep the catalyst at operating temperature. Tire pressure also seems to be an important factor - keep pressure at the recommended level, which we believe is 35 psi. The Prius really is not designed for a commute like mine - 50 miles of high-speed freeway driving with a mile or so of city driving at one end and five miles of normal-speed highway on the other. I generally reached about 41 mpg on that route, driving at high speeds; that's roughly the same gas mileage I would get in a new Corolla, a little above my own 1999 model. (That is in some ways unfair, since the Prius is an automatic, while a Corolla needs a five-speed to get 38-41 mpg; and because test cars nearly always get lower mileage than ordinary cars, because they are not broken in as well). On the other hand, when stuck in traffic, I saw the gas mileage rise to 75 mpg, and others claim that you can actually get close to 100 mpg inching along through heavy congestion. I've had jobs where I could probably have gotten a good, steady 60 mpg in a Prius without much trouble, crossing the bridges into New York City. The Prius would be a phenomenal city taxi, and we understand that Yellow Cab of Vancouver, BC, is testing one for just that reason. The electric engine should last pretty much forever, but whether the transmission (which includes planetary gears and a chain drive) can hold up to steady city use over the years is another question. We'd certainly love to see the thousands of city cabs in New York, Vancouver, Chicago, etc. move from their current sub-20 mpg mileage to 55 mpg! Likewise, city police could easily switch over to cars like the Prius. New York City cops used low-performance six cylinder engines for many years to get better gas mileage, knowing that (a) they were capable of any speed you can reach in the city, and (b) the police have a thing called radio. The applications for delivery people are enormous - local pharmacies and couriers could make great use of these cars. Indeed, the last electric truck in New York City was a UPS truck, and it was only taken out of service because parts were no longer available. Package delivery firms are again looking at electric and hybrid powertrains, since they can recover most of the energy ordinary trucks lose in stop-and-go traffic. Once you understand the Prius' advantages in gas mileage and pollution (it is a super ultra low emission vehicle), you can start to consider the mundane questions: is the Prius practical as a daily driver? Is it comfortable and well designed? In short, does it feel like a car on the bleeding edge, or is it something you would like to buy and drive for the next ten years? Our answers are mixed. First, the Prius has a fairly spacious interior, at least by Corolla/Civic standards. While not exactly a Dodge Stratus or Toyota Camry (which sell for roughly the same price), the Prius has decent room, and feels larger inside than it should because of the "tall car" design. Passengers have plenty of headroom, and legroom is adequate for most people. It will seat four comfortably and five if the three in the back seat are small or don't mind physical intimacy. 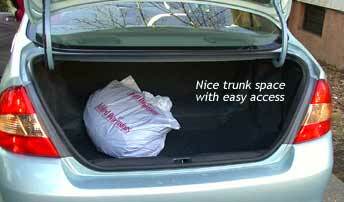 The trunk can easily swallow up large packages and groceries, with a good, wide opening. The trim looks good, without the patterned fabrics we've come to expect from cars aimed at the youth market. Simple solid grays provide a classy appearance, though close inspection shows that the trim is fairly cheap and lightweight. That doesn't mean it won't last, and weight reduction is an important contributor to gas mileage. Sound reduction was mainly a matter of design, rather than heavy insulation. That makes the Prius much lighter than the aforementioned Stratus, while maintaining a quiet interior. The engine doesn't make much noise most of the time - when on electric mode, it is silent - and wind noise seems to have been cut back through aerodynamics. Overall, the interior feels to be about as quiet as a Camry, though when at 4,500 rpm the engine is fairly loud. Most of the time, drivers will not be calling for that much power; and the engineers may have deliberately let the engine be noisy at maximum revs to remind drivers of the consequences for fuel economy. The interior is comfortable, with seats that hold the driver well enough during sharp turns, yet allow freedom of movement. There is no traditional instrument panel, only a small electronic display in the center which is surprisingly easy to get used to. We do miss an analog gas gauge, though, not to mention a real temperature gauge; the Prius only has a blue "cold" icon, and the gas gauge is "somewhat" accurate at best. (On moving back to an "ordinary" car, we realized Toyota is not kidding when they say it is easier to use the center-mounted speedometer, since it is further away from the driver and easier to quickly glance at while driving). There is also a touch-screen display which shows gas mileage, the power mode, and radio controls; a navigation system is optional. 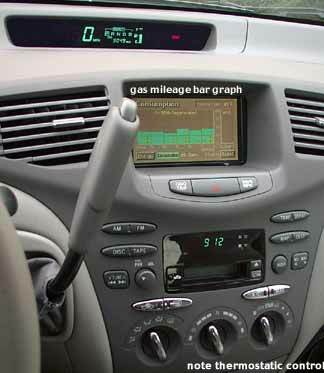 Gas mileage is shown as an average, an instant reading, and a bar chart for every five minutes the car has been driven. The latter provides the best way to tune your driving to the car's fuel economy needs, and would be welcomed on gasoline-powered vehicles as well. The power mode is somewhat less useful; though the graphics are pretty, they actually lag behind reality by about one second. When the engine runs because it is cold, rather than to charge the batteries or create power, it still shows as being off on the display. Likewise, the engine will keep running, even when the car is stopped, after the "cold" icon disappears, which tells us that the display and the engine are using different standards. 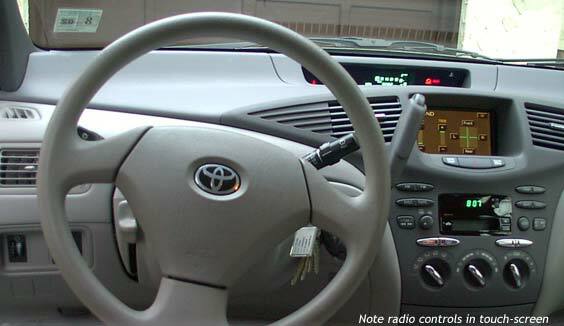 Likewise, the screen is not an appropriate way to set the stereo controls; it is a better system than the Cadillac Deville uses, since there are both conventional radio controls and the touch screen, but it really requires too much driver attention to do simple things like adjust bass and treble. The stereo sound is much better than we expected from Toyota, not quite up to modern premium stereo standards but good enough. It is far better than the Echo or Corolla units. The climate control system is easy to use and figure out, with a simple dial control to set the temperature (which is thermostatically controlled) and fan speed (which can be set to "Auto" to best maintain the temperature). We wish all cars had controls this easy to use, rather than the inane systems inflicted on us by most automakers. Heat came fairly quickly; we did not have the opportunity to test air conditioning, but we don't expect much based on other Toyotas. When the heat is on maximum, an electric heater kicks in as well. Other creature comforts are about what one would expect from an upper-entry-level sedan: primitive cupholders, a capacious center console storage unit, and a felt-lined cubby for change and whatnot. There is also a small compartment in the center stack which may be taken up by a CD player. Visibility is good in all directions, especially due to the high driving position. Acceleration is moderately slow but very linear and predictable at low speeds; however, because acceleration is limited by the computer rather than the powertrain (the electric motor has a great deal of torque), it is practically the same at high and low speeds. This means that mashing the pedal on the highway has an immediate and surprising effect, making the Prius seem more powerful than one would think. It makes passing very easy. It takes a moment after turning the key for the engine to start. The gas engine on our model always started, even when the engine was warm, but others report that sometimes they can start out on full-electric mode. Torque steer shows up mainly on initial acceleration. The Bridgestone Potenza tires on our test car are a step above the standard car tire, and they help handling quite a bit. However, this model tire tends to slip a bit at low speeds, and is a little chirpy. The good news is that the Prius can easily be whipped around sharp turns, even though the ride is very good for a car of this size. It's not a sports car, but it plays one on TV - and most drivers will find it to be more than good enough. The ride and handling are well balanced. The transmission, such as it is, can be intrusive at highways speeds, with the car bumping a little as it recharges the batteries, moves the engine up a notch, and otherwise fine tunes the power output. It feels as though it is going in and out of gear on a regular basis (it isn't) because the power drops for an instant every so often. Likewise, because the gas engine seems to have a limited number of speeds, maintaining a set speed is somewhat difficult. This may be why there is no cruise control, unusual in a $20,000 car [in some areas, such as Canada, cruise control is standard]. Around town, though, everything is smooth, and this is meant to be a town car, not a highway cruiser. It does well enough for the occassional highway trip. The "stealth" mode, where only the batteries are used, is kind of fun if you can stay in it, which requires painfully slow acceleration. Like it or not, over about 35 mph, the gas engine is almost always on (while cruising; it always shuts while decelerating). Even going to 25 in a reasonable time requires the gas engine. On the other hand, the noise of the gas engine does not increase as you accelerate; it stays at a constant speed, and the electric motor quietly whines a little louder. It's a cool way to drive. As Bill wrote, "it is not an electric vehicle and doesn't even play one on TV unless provoked. The battery pack only provides enough energy for 2 to 3 miles at moderate below-40 mph speeds." There is a B setting on the transmission for times when you are coming down a steep hill and need the engine to brake; but we recommend only using it in emergencies, since it takes more power. That isn't really explained in the owner's manual. The brakes have a different feel; a light pressure on the brake pedal brings normal-feeling braking, but move the pedal down just a little more and there is an abrupt transition to the hydraulic brakes. Slow, early braking raises gas mileage by allowing the generator to slow the car down. This doesn't require much a change in driving habits, and is safer than waiting until the last second. (Like the gas pedal, the brakes are a "fly by wire" system, where your movement of the pedal is given to the computer, which then applies brakes or power). After getting back into an "ordinary" Toyota, we realized that we had become so accustomed to the brakes that we expected the Echo and Corolla to stop the same way. Indeed, we missed the feel of the regenerative braking and the knowledge that we were, in a sense, getting our gasoline back. The foot operated emergency brake makes sense in an automatic-transmission car, but we don't like the push-once-to-set-and-again-to-release mechanism. It's too easy to accidentally release and too hard to intentionally release compared with a hand-operated release. If we were to compare the Prius to other cars based on the driving experience alone, we would say it is overpriced by about $3,000, even if you consider the three year bumper to bumper warranty (which includes normal maintenance and loaner cars for VOR failures) and the eight year / 100,000 mile warranty for hybrid components. However, its impact on the environment is minimal compared even with most subcompacts, and if gas prices should rise, it would provide some real long-term savings. Let us stand out from the Expedition-driving crowd, those who think that bigger is always better, that there is unlimited clean air and gasoline, and say that the Prius is worth the extra cash - especially if you do mostly city driving. If, like me, you are on the highway most of the time, think about a five-speed Corolla instead, if you can deal with the small interior. As for the choice between Camry and Prius - we hate to say it, but the Prius wins, thanks to its incredible efficiency and clean engine. I enjoyed reading your page on the 2001-2003 Prius. We have a very early 2002 Prius delivered in January 2002. It came with air conditioning, driving lights, 6 disk CD player, side air curtains and cruise control. It is a beautiful blue gray color called Blue Moon Pearl and according to the literature was not available on the 2002. Gives you an idea of how early a 2002 our car was. When I went to buy touch up paint we could not find it for the 2002 but for the 2001. In addition we had the problem with the steering that required a new rack and pinion. It took about two weeks to get it ordered and installed during which time they gave me a Saturn. That sure made me appreciate my Prius. We haven't had any problems since the rack and pinion episode. We can't say enough good things about our Prius. We have always had large cars or long wheel base pickups so never cease to be amazed at the turning radius of the Prius. It accelerates as fast or faster than most cars when getting away from a stop light so we have never felt a need for any more power. Our hot rod days are behind us anyway. We make frequent trips to San Antonio, TX which is 35 miles away from our home in New Braunfels, TX. Because of our climate we leave the air conditioner on all the time and let the automatic temperature control decide what to do. On our trips to San Antonio we average 42 mpg. We drive the speed limit of 70 mph most of the way. I use the cruise control a lot on the freeway and it holds the speed very well. For those of you who think Texas is sparsely populated with cars, our freeway is six lanes and we need eight. On occasion we drive in the country taking in the scenery and have gotten 52 mpg. I'm not obsessive about the milage though as the car is just a "hoot" to drive. The air conditioner is excellent. It cools the car fast and maintains a pretty level temp. One interesting feature is that when stopped at a stop light the engine may cut off for a short time and we can feel the temperature and humidity rise. Then the engine starts to run the compressor and the temperature and humidity almost immediately drops. Our summer temperatures average 95 degrees for highs and 75 degrees for lows so the air conditioner gets a great workout. Around town in the winter we average 42 mpg and in the summer 36 mpg. Our average trip is under two miles at a time so there is a lot of stop light and warm up time. 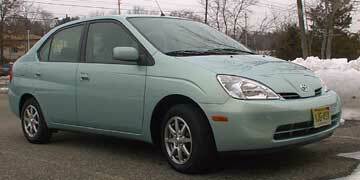 I had an opportunity to drive a 2005 Prius a month ago and was pretty disappointed. The touch screen monitor is not shielded so the sun makes it impossible to read. They moved the speedometer over to the left so the steering wheel interferes with my view. It does ride slightly better but it's pickup isn't as good. I expect they are aiming it at the young family set who aren't interested in practical autos. If they don't go varoooooom!, varooooom! they aren't going to buy them. I think Toyota missed the boat on the new Prius. Unless cooler heads prevail at Toyota I am unlikely to buy another Prius in spite of, and probably because of, my love with my present Prius. Having driven a UK spec 2005 Prius for two months I cannot agree that it isn’t a better car than the original! Toyota seem to have redisigned the Prius in a number of ways, my most favourite being the addition of an EV button, putting the car into battery mode only until you reach 32 mph or the battery flattens [this is not available in the US]. This is a great idea and I have managed to run for 10 minutes or more around London without the need for the engine. I am buying a 2002 model for myself now , simply because I can’t afford the 18 thousand pounds of a new model, the four year old model being half that ( big depreciation?) but Toyota has been really helpful and I look forward to a Prius of my own...pity it looks so boring ! You can also read the toyoland review of the second generation Prius.